There is always concern about offset. It's the last frontier before reaching Eldorado. If it's good, and it's stable, then we have ignition. I'd now sit on your pcb design, doodle it for a couple of weeks to be absolutely sure, and then have it made. I use ourpcb.com, their service is good and they do excellent pcbs at moderate cost, and just get four done to begin. Your production run will inevitably need changes, so don't commit too early. Finer points of pcb layout are very hard to detect at this stage. You really have to build it now, have the thing in your hand, turning it over and inspecting it whilst building, before you have the full, 3D picture. A short starting pulse approaching 1Vpk is going to eventually damage something attached to the connected headphones. Why not use a 3-pos switch to switch both main power and then connect your headphones? It's a small burden to have to wait a second before turning the power knob one more click 'round, and the time it takes you to turn from "ON" to the "Engage 'phones" might even be long enough for the amp to settle. Just make sure you buy a very nice switch. I like that idea. The middle setting could simply be "mute". We would have to demonstrate however that it was impossible for a human to flip the switch fast enough however. I'll get my hands on a SPSP switch, I don't know why I didn't have a couple available here. In the meantime, I'll stare at the board layout intently. I've already got a couple things I want to iron out. Here's an automatic way to do it (although there may be better ways). The bottom half of this figure is a filament supply and automated mute switch. The 8.8V output is just a regular filtered DC. Substitute the rail supply for this. Now look at the two FET's. These are in series and both must be on in order to open the mute relay (not shown in this diagram). The relay coil is connected from the 8.8V output to the relay common. 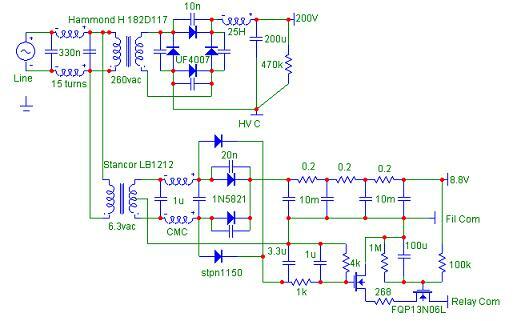 The gate of one FET is powered by the two diodes that are outboard of the diodes for the 8.8V supply. It's done this way so that as soon as the power is switched off, this FET stops conducting immediately. You can change the timing by adjusting the relevant resistors and capacitor. The other FET gate is powered by the 8.8V supply, through the 100k resistor. It must charge up the 100u cap before the FET will conduct. So, upon turn on, the mute relay doesn't open until the amp output has had time to stabilize. But the relay closes upon power off, before the main supply droops low enough to create a transient at the output. Last edited by Sheldon; 21st May 2011 at 04:40 AM. If this is not the first priority of you guys, I understand! PS: I just want to know if this is OK. I know it probably isn't optimal or perfect, and that is fine. I'm not expecting anybody here to walk me step by step into optimising it and wasting you're time. Then again, if you have a real quick tip to throw at me, I won't mind. It might work but try to keep the output stage together. A pro wouldn't place parts like you have done.